Is anyone interested in running long (14 ish) on Sunday in Montgomery County? I was thinking of Violets or Pennyfield Lock. I ran there today and it was very nice. 10am? Is there a run planned for Saturday morning? Can I suggest a meetup at the store at 8:30 am? 10-12 miles for me. Does anybody know of any races in the next couple months that have a team competition. I think it would be nice if we could a decent number of people from the team together in one place for a race. I am planning on running the Veterans Day 10k in November and I know this race has a co-ed team competition. Thats at least one possiblity, any other suggestions are welcome. Please provide some of your own methods and madness for keeping your legs and joints and feet healthy and looking forward to the run. I am consolidating a list from runners around the way. Epsom Salt Baths, the Ice Bath, the Massage, Weights and Yoga, throw out some of your secrets. The key to enjoying running is to be able to walk with a genuine smile after the race. Running until death is looking at you in the eye, does not seem to behoove the Citizen Runner. I did my long run on Sunday and I think I saw Melissa moving out there in the Park as others milling about. I did not get a chance to see Dane----oooops I mean Dean, speak at the store on Saturday. Anyone have anything to say about his words of wisdom? I am running it. There's no prize money or frills, but the entrance fee is only 10-15 dollars and it to benefit their team. No idea what the course is like... but a flyer for it is at the store. Company is always welcome. In case you were itching to read about my Lake Winnipesaukee Relay, please fee free to click on over HERE. It is long but there are pictures! 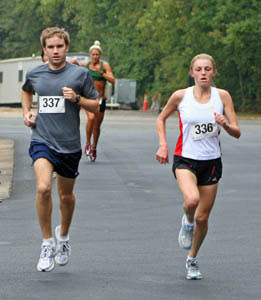 Scott Munro (25) and Megan Sowa (24), both of Arlington, approach the finish of the Navy Federal 5K. Sowa won the women's race in 19:22. I want to do a 2hr. run in Rock Creek on Sun at 8:00am. Meeting place is Pierce Mill(parking and bathrooms). It is located between the Store and the DC/MD line. The run will inlcude trails, hills and some speed surges mixed in. Creative and interesting run. Good workout. Total of about 14 or 15 miles. Gatorade and Bagels after. Dean Karnazes will be at the store on Saturday to lead the group run. The run will begin at 9 a.m. and it will be 4-5 miles. After the run we will be handing out free copies of his national bestseller Ultramarathon Man, which you can get autographed if you would like. Following the run, we will have a number of different things going on. We will have a question and answer session with Dean, in which we may have to hold Max back to avoid him from possibly getting tasered by the police. Runners World and Nissan will both have some things going on outside the store. Ben and I would really appreciate it if you could make it to the store on Saturday. The more people we have out for this the better. Melissa (Kitty) Tanner set a big PR in the Park's Half Marathon with a time of 1:20:21. Pat Reaves, who has been meeting on group runs, ran a 1:13 low...this must be a huge PR for him? Awesome job Pat! Max tempo'd a 1:17 something. Dave O better watch out. Marshmello fluff and cosco brand jelly with wonder bread topping it off. (Jake's regular diet before a run) Too many runs on the asphalt along the Charles River took their toll. Taking hot yoga tonight and then watching the BOSOX clobber the yanks. I suggest buying some Bill Rogers stuff and hanging it on your walls as its going out of business. also, go on Jake's sunday run as its a nice alternative to the regular runs we do. who is doing the run from the store tomorrow with MEETUP? Jason, Wiggy and I are meeting at 10am on Sunday for a run at Riley's Lock. 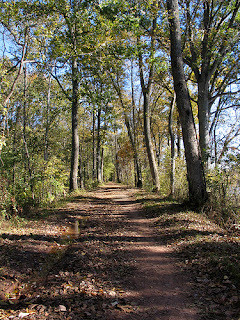 The high should be in the mid-70s...perfect for a mid-morning autumn run! I plan on running at least 12. All are welcome. I am watching Melissa (and $teve?) run the Park's Half earlier that morning before heading to Riley's. Directions: From I-495, take the River Road west exit. Continue several miles until River Road turns left at Seneca Road (there is a stop sign). Turn left, then proceed a few hundred yards until Rileys Lock Road on your left (13015 Rileys Lock Road - Google Maps, MapQuest). I NEED SOMEONE TO MAKE ME RUN FAST THIS FRIDAY(MORNING OR EVE)CANAL OR TRACK. I HAVE BEEN IN BOSTON READING POETRY AND LEARNING TO DO GOOD(MATT, YOU WOULD BE PROUD) WENT TO HIGHSCHOOL REUNION. 20 YEARS HAS GONE BY. NO, MATT DAMON DID NOT COME. NATE ALBERT, OF THE MIGHTY MIGHTY BOSSTONES DID THOUGH. NOW MOST OF YOU REALIZE I AM INDEED OLD. HOW MANY OF YOU HAVE HIT THE 10 POST HIGHSCHOOL SPOT? I plan on doing it. It is along the canal. 25 bucks, but they provide breakfast, prize money, raffal, and t-shirt. I decided to test my fitness this morning at a 5k race in Baltimore this morning. For some reason, my legs just didn't have it. Either that, or I am in 17:24 5k shape and my legs really had it today. I hope it's the former. I didn't know who would show up for a 7am race on a Tuesday, but the 250-125-100 cash purse brought out a few good guys. As I lined up, I saw who I assumed to be Dave Berdan and a few others that looked fast. We started off and after a quarter mile I could tell that 4 guys felt really good and I was not one of those 4. I immediately bagged any ideas of winning money. My watch didn't start so I don't have splits but the leaders said they went through in around 5:00 and I was a good 20 seconds behind. I think my second split was around 11:10 but that is a complete guess. Then the last mile was hilly and ended up on Federal Hill. I'm a little baffled how I ran 27:20 or whatever at Rockville and now can only muster a 17:24. Oh well. After the race I cooled down with a few people including a former Navy runner (Justin Mikolay). I don't remember him from college because his senior year was my freshman year. Hopefully I'll run into him again at some point and get him out on some of our runs. I am going to watch the Navy Cross Country Invitational on Saturday morning (10am) in Annapolis. My alma mater will be there along with a number of other area colleges (American, Navy, GW etc). It should be a good race to watch, but I also plan to run for an hour or so on their nice green grounds. If anyone is interested in watching/running, please let me know. Meet at the store at 7am. mile repeats on the track. 5:20, 5:10, 5:05, 5:00, 4:50. 400m recovery. As of now, Ben, Wilson, and myself. The training run last night was good. Hard run. We did the equivalent of 13x800 with 1 minute jogs in between. this combined with 2 mile warm and 2 mile cool down makes for about 12 total miles. My toes are hurting and my hamstring is tight. other than that, i am ok. Steve(lots of)Money, Klim, Scott, Chris and this new guy, Billy, all look strong. It was a grueling run as the heat and the bugs were terrible. After the run we all looked like navy seals just emerging from some swamp. Munro looks like he is rounding into form, as does MONEY. Imagine doing 4 more sets of those! Your legs would not forgive you for some time. However, if you are willing and able, keep trying to slowly ramp up the distance. Your marathon times will get better. I will be at the store this Saturday for the first time in two weeks to do an easy run. I will have the store open at 8:15 for all those interested. I am only going 6 or 7 miles because I am running a race later on that night. Everybody else can plan how far they want to go in the comments below. By the way, if anybody else wants to race Saturday night you should come to the Arlington 9-11 5k at 6 P.M. There will be a nice post race celebration according to the races website. Tuesday evening, I was thinking 10 or 12 x 400 at 69/70ish with 400 jog recovery. Not sure of a track, open to suggestions, the Georgetown one should be empty by 6:30ish? Was also thinking of an extended cool down to get in the miles . 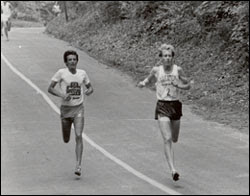 Tomorrow's run is named after Wilson for the very reason that he introduced me to it. Total pain and misery. After each of these, Wison would praise god for allowing us to survive to run another day. I say we try it tomorrow. It consists of 2 mile warm up and then 10X3 minutes on 1 off, 2 minutes on, 1 off and 1 minute on and 1 off and over and over. basically 90 minutes of hell. after though, the endorphins are chirping and you want to go home and drink and beer and think about pleasant things. 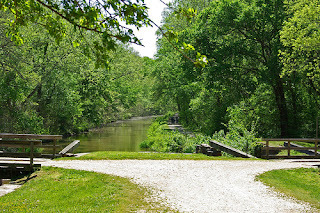 Not to clog up the blog, but Joe Wiegner, hereinafter known as Wiggy, and I, plan to run on Friday at 6:30pm from Old Angler's Inn along the canal and some trails. If anyone in MoCo or elsewhere would like to join, let me know. I'll also be there on Saturday whether we meet at the store or the "line". I ran a 1/2 marathon at marathon pace yesterday. Not an easy course. It was on the Mt. Vernon Trail, which twists and turns and is hilly. Solid race and there were some very good runners to push the pace. Wardian came out and ran his third race in three days(i must commend his recovery ability. Totally awsome. I did what I wanted and it capped a 40 mile 3 day stretch. Ran the whole thing very comfortably at 6 minute pace. Legs are strong as its a matter of making sure I do not tweak any muscles. BTW_______Timm, take it easy on your workout today. No use coming back too fast and re-injuring yourself. Having fun out there and enjoying myself. Also, did anyone see Lagat win the 5ooo at the worlds? Totally great tactical effort on his part. I've met many of you, but others I still haven't gotten a chance to run with yet. After a three month stint with IT issues - I've been running for about a month now and loving getting fit again. I'm a high school teacher and coach, so my schedule is busy, but I'm really looking forward to training at a high level again. At 26, I miss running personal bests and want to put up a strong marathon time. I do travel many weekends to North Carolina where my girlfriend is a college soccer coach. I might be able to do weekday tempo runs or interval workouts. I also have Saturing morning invites, but I'm interested in doing 10 miles on Saturday evenings around 6 in the evening. In addition, I would love to meet up for long runs of 16-20 on early Sunday mornings (8 AM) or when it gets cooler - I wouldn't mind the afternoon. I live in Montgomery County - but I'm looking at running down in Georgetown at least once a week. I love running in DC - it helps me stay balanced with the life of a teacher and coach. Matias has also really inspired to going after some of my dreams that I have deferred for a while with my teaching and coaching responsibilities. I'll probably run Chicago (or part of it) since that's where my family lives, but I'm really going after getting ready for few Florida races in the winter months and a March Marathon - VA Beach or National, perhaps? How's the training going for everyone? tomorrow: 8 x 800 at 2:25 pace with 800 recovery at 3:30. one mile warm up and down. On the capital crescent. will leave the store at 6:30. would love some company as this is my first attempt at a little workout.